Tired of wasting spoiled hay every year, Amy Rush trialed HayKeeper Breathable Covers on her family farm two years ago and hasn’t looked back. Initially only purchasing one, she has since recognised their value and purchased additional covers, a decision she didn’t even need to think about. HayKeeper Breathable Covers protect round hay bales from the elements, while allowing the passage of air and moisture out of the hay to prevent condensation and mould growth. Protecting hay from weather damage also significantly reduces the cost of wintering cows each year. Covering the bales with HayKeeper Covers provides an economic advantage, especially if a portion of this year’s crop will be carried over into next years’ feeding period, which is exactly how Amy uses the covers. Thats a return on investment of 100% in the first season alone, Amy added. HayKeeper Covers lay over the stack of bales and then are secured by using the click clack system and weighted down with gravel bags. The stack must form a pyramid shape so that any water that hits the cover runs off. HayKeeper Covers offer maximum flexibility to keep your animal well-fed all year round. 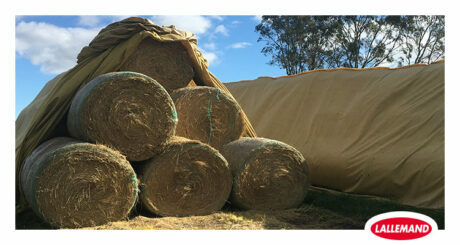 They are transportable and allow you to keep your hay protected in the field which minimises the need to transport them. “They provide us with security over the seasonal conditions that we experience in Victoria by allowing us to store surplus hay outside, plus they are a lot cheaper than building a new shed,” Amy concluded.